My interest in nutrition actually started many years ago; to be honest it was when I had signed up as Neways consultant. Part of the training was to listen to tapes which discussed nutrition being the answer to fighting disease rather than pharmaceuticals. Some of my early influences were Anthony Robbins who was into eating food that didn't have eyes; this started my experimentation with vegetarianism, or as it soon became know as 'Flexitarianism'. I just can't say no to Duck! Following on from this I attended Michelle's Natural Food Preparation Classes, which Jason Donald and I discovered at one of our Neways meetings. I got a number of my go to dishes and non toxic practices from the classes that I still use today. It was probably around four years back that I caught up with Ol’ Mate Kate Radford, she had just returned from the south of France where she was nannying on a super yacht. Whilst off duty and lying around on deck sunning herself, Kate had been investigating nutrition. That seed grew, piqued my interest in nutrition again and after some Googling and I came across the Paleo movement. I spent the next 2 and a bit years reading, listening to podcasts and experimenting with Paleo and some of the Paleo variants like Mark Sisson’s slow carb program. It wasn’t long before my born again Paleo preaching started to drive everyone around me nuts. Like all the other Paleo nuts, we became the new jehova’s witnesses of nutrition. And then, slowly but surely, the Paleo movement became more and more mainstream and more and more people came on board. I think it’s quite logical really, some of the guiding ideas behind Paleo is that the food you eat isn’t processed, is as whole as possible and represents what humans have eaten for the past million odd years. Then in November last year, I went to Gold Coast for a holiday and stayed with Kate’s sister Sarah Radford; one of my best friends from College. As you might expect, Kate had gotten Sarah on board and she was on the fat program. This trip was just what I needed, we listened to some Keto oriented podcasts as we drove around and the food we ate was in keeping with the macro nutrient ratios one needs to enter a state of ketosis. I just saw this movie, Cereal Killers, and was inspired to share it! It's only been a couple of decades since the internet became available to the public and in that time it's become such a part of normal life for so many people worldwide. I think back to when I was growing up, which was only one or two years ago… There was no Internet, we had computers and even bulletin boards that you viewed by dialled into them using very low speed modems; well low speed compared to today's standards. Last night I joked with my mother that I couldn't fathom how she and Dad managed to bring us up without the internet. How different would we have been with access to all that information just being a click away? So invasive has the internet been to our everyday life, that we are always carrying devices to access it; devices we sometimes use to make calls. Compulsively connecting with friends on Facebook, looking up when the next tram is coming, recording a TV show on our digital recorders at home, reading emails, taking and uploading photos, every spare minute is filled with any manor of internet powered task. All this connectivity and convenience can become an addiction come dependence; some see this as detrimental and others of us like me embrace it and expect it at all times. This in itself creates many first world problems. When travelling overseas, data rates can be excessively high and left unchecked a nasty little surprise form your phone company could be waiting for you in your letterbox upon your return home. I may have had one or two of those experiences; with what I thought was restrained internet usage I racked up a $2,500 phone bill. Here is my sure fired way to travel, stay connected and do it at a reasonable price. Firstly, turn off data roaming; you do not want your phone to transfer data directly over the phone network for any reason when you are roaming. You will need to get yourself a Pocket WiFi device. These devices connect to mobile phone networks and then share internet access via wireless or WiFi for up to five devices. You can find these on eBay for quite a reasonalbe price; just make sure it isn't locked down to a particular phone network. Next you need to get a Sim card for the Pocket WiFi, it's easiest to do this when you land in your destination country. It pays to do some prior research and look up the available carriers and their network coverage. Locate one of the carriers stores, talk to a sales assistant and let them know you are looking for a data sim card for the the Pocket WiFi device. The sales person will advise you on the best plan for data. Make sure the card is activated before you leave the shop and you have instructions on how to top it up, should you need to. I found in New Zealand that I could get a prepaid sim card with 500MB preloaded for around $30. Once that 500MB was used, for $20 more you get 2GB. Get the assistant to activate the card and make sure you keep the Sim Card pack which has info needed to top it up online, if needed. Once up and running you will be able to connect up to 5 devices at a time to the internet at reasonable rates. This is perfect for checking emails, satisfying that Facebook fix and sending out any tweets; I wouldn’t download movies from iTunes but the odd YouTube video shouldn't use all your data allowance. Is that Acetone I detect on your breath? I heard about the Ketonix on one of Jimmy Moore's podcasts and mentioned it to my chiro, Dr Steve, so he purchased one of each model and we are now going to give them a go. Since about November 2013 I've been trying to keep myself in ketosis and learn as much as I could about living a fat friendly, low carb life. 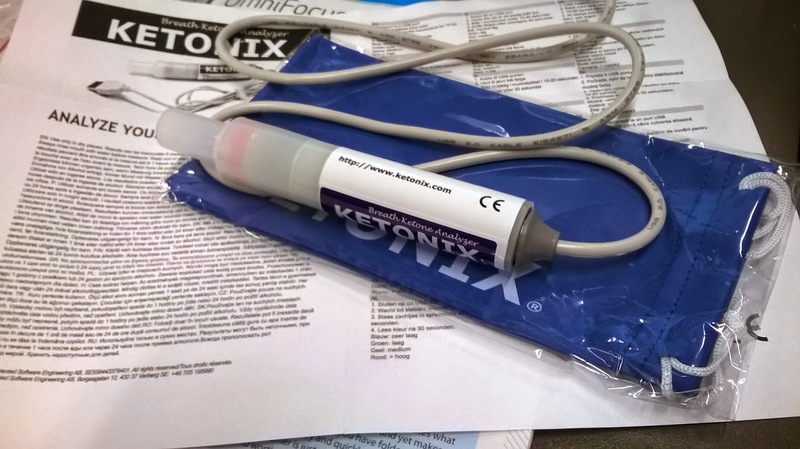 Initially I was using ketostix to measure ketones in my urine :) nice, I know. But after a while it can be a bit of a drag, so I just got used to how it feels to be in ketosis and just used my gut. But now we have the Ketonix, so lets see how this goes.